So I am reading an article on ZDNet.com and on top of the article I come across a set of icons. See the image below. A couple of them are obvious. I can print the article or email it to someone. A more interesting one is the little rectangle with up/down thumbs along with a few numbers. This enables me to rate the article by giving it a thumbs up or down, which provides a metric on its worthiness. As you can see, this particular article has 71 votes with an overall score of +45. The curious item in the set is the “share” icon which expands to many other items as shown above. A few are familiar household names such as Google, Yahoo! and Facebook. While others such as Digg (www.digg.com), Delicious (www.delicious.com), StumbleUpon (www.stumbleupon.com), Reddit (www.reddit.com) and Technorati (www.technorati.com) are lesser known. Most news and media sites nowadays provide a few of these next to any article or news item. For example, The Wall Street Journal (www.wsj.com) lists Mixx (www.mixx.com) and NewsVine (www.newsvine.com) among others. While AIIM (www.aiim.org) includes Xanga (www.xanga.com), FriendFeed (www.friendfeed.com) and Propeller (www.propeller.com) in addition to the more common ones. So what exactly are these? What are they good for? And how do we use them? Back in 2005 a friend one day said that she had an idea for a new business: a web site for storing bookmarks on the internet. I smiled and said that it would be useful but I didn’t think that it was enough to sustain a business. I argued that a company like Yahoo! could easily add that feature. Secondly, it was technically very easy, so anyone could do it. It would be hard to build sustainable competitive advantage around it. More importantly I didn’t see how anyone could make money with it. Well, I had certain valid points. For one, Yahoo! did its own bookmarking site called Yahoo! Buzz. But I was wrong overall. After the painful lessons of 2000-2001 in the San Francisco Bay Area, I was of the belief that a simple idea with no revenue potential cannot be a successful business, regardless of the hype and a catchy domain name. But the reality is that the web doesn’t follow the traditional business model. And the advent of the social web in the early to mid 2000s has once again redefined the norm, scale and the possibilities of what an internet-based business can be. The power and success of a social networking site is not measured based on its revenue, which may be zero! It’s rather based on the size of its network. For an idea to become a successful internet-based business, you don’t need to build a space rocket. And you don’t necessarily need to make money with it. Youtube, Facebook and Twitter are good examples that support my point. Today social bookmarking is a major topic in the Web 2.0 world, and there are over 20 social bookmarking sites with millions of users and 100s of millions of bookmarks. You can see the list of top 20 of them at: http://www.ebizmba.com/articles/social-bookmarking. These sites allow a registered user to bookmark a page; that is store a URL along with some additional information on the internet. But there is actually more to them than just that. So let’s look at this topic in more detail. So why is this any better than just bookmarking a page on your browser; e.g. “favorites” in Internet Explorer (IE) or “bookmarks” in Firefox? The primary problem with this is that a browser based bookmark resides on the laptop or computer that you are using, where the browser is installed. So your stored bookmarks are in a physical file sitting on your computer file system. Now if I want to access my bookmarks from another computer, you are out of luck. The other drawback to browser based bookmarks is managing them and finding what you are looking for. In IE we can create bookmark folders and categorize them into these static folders. But then there may be links that we want to put in multiple folders, which cannot be done well. So as the number of bookmarks increase, their management becomes a serious problem. Firefox provides the means for tagging a bookmark which is a better approach than IE’s. This is also the approach used by some of the social networking sites. Social bookmarking sites solve the bookmark management problem via tagging. When you bookmark a URL you define a set of tags along with it. You can define as many tags as you like. These tags can be anything that you want but many of these sites will actually make suggestions when tagging. You can define as many tags as you like. These tags define virtual folders that can be navigated later on. But since tagging is just a word association, a bookmark may belong to several of these virtual folders (each being a tag). When looking for a particular bookmark you can simply navigate your tags to quickly what you are looking for. Obviously good tagging practices becomes important here. If a bookmark is not properly tagged then it may be difficult to find it among a large number of bookmarks. These sites may also provide a tag cloud to help you navigate your bookmarks easily. In addition to tags, these sites may also allow you to define additional attributes such as description and comments for the bookmark. More important than tagging in social bookmarking sites, is the social aspect to these sites. Just like other Web 2.0 wiki like sites, these are social, collaborative and networking sites where you can share information (profile, tags and bookmarks) with other users on the site. You can rate someone else’s bookmarks and comment on them. Many of these sites such as Delicious and Digg enable you to have a network by linking with other users and exchange messages with them. 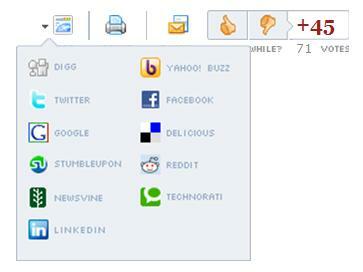 For example on Delicious every user has an inbox so that one can send a bookmark to another user or receive bookmarks. On Delicious I can also subscribe to tags so that if a bookmark with that tag is added I will be notified about it. Of course not all bookmarks need to be public. On Delicious I have the choice of making a bookmark private, a useful feature that is not offered by all other sites. One of the interesting benefits of the social aspect of these sites is that at any given time you can see the hottest and most popular items because of the number of times it has been bookmarked, buzzed, digged, the ratings (like/dislike or thumbs up/down) and number of comments that a URL receives, are different metrics for how popular or important an item may be. So usually the home pages of these sites that are accessible by all without registering, make interesting sites to visit on a regular bases for the latest most popular and most interesting stories and news on the internet. Post and Share a URL: Sites such as Facebook and Twitter are not really bookmarking sites. You simply post a link to them so that the people in your network can see it. For example in Facebook you send a link to specific people via a message or you share it by posting it to your “wall”. The same is true with Twitter. Many people use Twitter to share news (in the form of shortened URLs) with their followers. But note that these sites do not maintain a categorized URL repository. Depending on how active you are, before long the link that you post on Facebook or Twitter will be burried under more recent updates. It is not really practical to refer to that link later on (though you can do it as all past updates are maintained by these sites). Bookmark, share, categorize and rank a URL: These are the actual social bookmarking sites where you post a URL and possibly classify and categorize it by defining your own tags (such as Delicious, Digg, and Google), or putting it in a pre-defined categoy (such as Reddit and StumbleUpon). These sites rank the URLs based on how many times a URL is bookmarked, favored, and commented on. When you go to these sites you can see the top bookmarks in various categories. Within these sites, there are some that are for link sharing with your network (e.g. Reddit, Yahoo! Buzz) while others such as Delicious and Google Bookmarks (www.google.com/bookmarks) are for saving your own bookmarks (which may be private) so you can refer to them later on. The two sites that I personally use most often are Delicious and Digg. I specially like Delicious since it has flexible personalized tagging mechanism. I can define whatever tags I want in addition to the ones that Delicious suggests when bookmarking. It is more of a bookmarking site since it also allows private bookmarks. It also provides convenient plug-ins for various browsers that make it easy to bookmark a page along with tags, and then easily access your bookmarks from its Sidebar, just as if they are the browser bookmarks. StumbleUpon is another very popular social bookmarking site with close to 8 million users as of this writing. Like Delicious it also provides its own browser toolbar. It has predefined categories (e.g. photos, videos, business) that you can specify as the topics of interest. You may either save a URL as a favorite or you can write a review for it. You can also blog right within this site. Similar to other sites you have a network of friends or subscribers. Reddit is another popular social bookmarking site. It provides a way for ranking and sharing URLs. It has a set of predefined categories called “reddits” such as pics, politics, funny, and technology, which are essentially general tags. You can also define your own public or private reddit. On any bookmark on the site you can rate it (like or dislike) save it as your own, or comment on it. If you don’t have a favorite one yet, you might want to try out a few. I believe different ones may appeal to different people. However I must say that I find some of them confusing and not as useful, intuitive and practical as others. This entry was posted in Social media and tagged bookmarking, social bookmarking, social networking, tagging, web20. Bookmark the permalink.